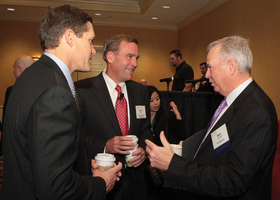 Mike Jackson, AutoNation Inc. CEO, far right, chats with Paul Johnson, CEO of Kelley Blue Book, and Gary Dilts, center, senior vice president of J.D. Power and Associates, at the J.D. Power Automotive Roundtable on Friday night.